Bilhore 16-year-old son Prakash died in July 2015 after his bike fell into a deep pothole. Since, Bilhore has been going about filling potholes wherever he sees them. 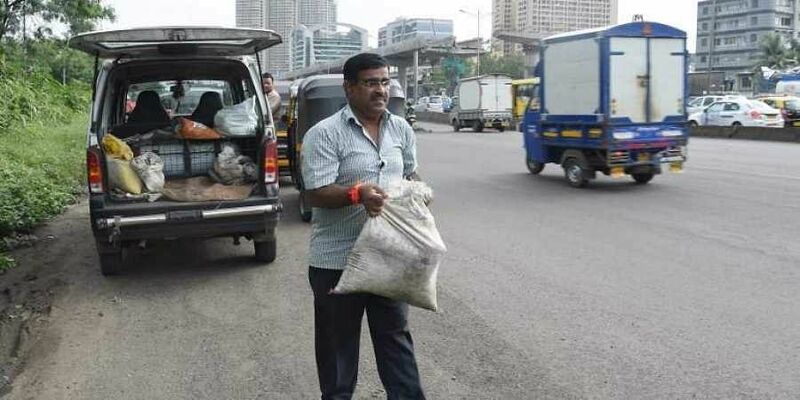 MUMBAI: Welcoming the concern voiced by the Supreme Court on the spate of accident deaths caused by potholes, Dadarao Bilhore, who made it his life's mission to fill potholes after losing his son, said he hopes the apex court's intervention would wake the government from its slumber and prompt it to direct urgent steps to address the issue. "I hope the concern expressed by the Supreme Court judges would alert government agencies to such grave issues and ensure that no other family has to lose its dear ones to such incidents anymore," Bilhore said, adding that he will keep filling potholes as long as he keeps seeing them. "I will keep urging more and more people to come forward and fix potholes. If only about one lakh people come forward and take this mission forward, our country will become pothole-free in no time," he said. Nitin Lade, a Mumbai resident, who, too, has made it his life's mission to fix potholes and has won four national records for running a digital campaign on the issue, welcomed the SC's intervention. "Just last week, a woman lost her life because of potholes in Mumbai. We found the photographs and location details of the pothole in our records, which we shared with officials of the municipal corporation. The woman would be still be alive if they had acted earlier," Lade said. Lade gathered information on more than 25,000 potholes in the city this monsoon. "People are still sending information on potholes in Mumbai to our website mumbaipotholes.com. The presently number 27,214. We have shared the information with all the agencies concerned, including the PWD. We welcome the Supreme Court's intervention and hope it will lead us to a pothole-free country some day," Lade said.